I don't eat all that many cakes. I love to bake, but since I try to stay away from the stuff, that doesn't happen all too often either. But there are a few times every now and then where I indulge. Today is a day like that. Today is fat Tuesday, and that means a special sweet treat in our parts of the world; a cardamom bun with marzipan and whipped cream, topped with a dusting of icing sugar. They are quite lovely with the combination of the spicy bun, the sweet marzipan, and the fluffy cream. We settle for one a year, for tradition's sake, but people must be going crazy for them because they show up in the shops and bakeries right after Christmas. I haven't been able to find a recipe in English, but with a little help of Google Translate I think most will be pretty clear. So, here's the recipe! There's a lot of noice in the picture, I know, but again, when you leave work at five there aren't many minutes left of daylight once you get around to eating the damn thing. Delicious! 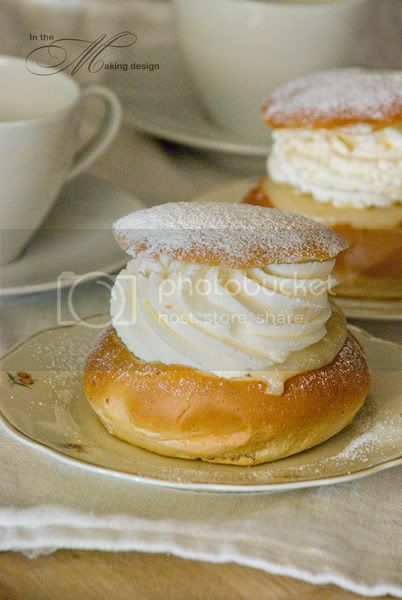 Vill också ha semlor!